For the kids and families - discover Easter eggs and discover The Triangle! The SCA (through Lisa How), representing the Shoreham community, will lay a wreath at the Anzac Day ceremony at the Flinders RSL. Others are, of course, welcome to attend. The Avenue of Honour at Shoreham poignantly remembers the supreme sacrifices made by young men from Shoreham in the Great War. Following up on our earlier efforts, another Working Bee has been planned for that important walking track. The intention is to continue monitoring regeneration and clearing any re-merging weeds such as Blackberries. Please join us for morning tea and a chat together afterwards. VENUE: Meeting room, Shoreham Rural Fire Brigade, Byrnes Rd. Please park on Byrnes Road. The CFA building must have unrestricted access at all times. Small eats will be available, great coffee, tea and milkshakes ! Please Bring: BYO coffee mug, small change for coffee, eats and a raffle. VENUE: Meeting room, Shoreham Rural Fire Brigade, Byrnes Rd. Please park off-site and not in assigned parking areas within the Station precinct. These sites are reserved for firefighters only - to facilitate rapid turnout requirements. A Public Meeting will be conducted by the Shoreham Community Association at St Peter's Catholic Church, Byrnes Road, Shoreham. The meeting will be held primarily for information for the community - all Shoreham residents, ratepayers, campers and other interested persons are welcome. Cr David Gill will chair the meeting. The March Cuppa and Chat event has been CANCELLED out of respect for Christie Johnstone whose funeral is planned for the same day. Watch this space for further details to be announced! VENUE: Shoreham Rural Fire Brigade, Byrnes Road (aka the CFA building) - PLEASE NOTE CHANGE OF VENUE. BRING: Entree, mains or dessert to share. Also your plates, utensils, glass, something to drink. PARKING: Please park off-site and not in assigned parking areas within the Station precinct. These sites are reserved for firefighters only - to facilitate rapid turnout requirements. The first working bee for this year will also be on Saturday, 23rd February - at 9:30am in Byrnes Road. The area that we planted last year with grasses (more-or-less opposite the Old School Hall) is looking neglected and needs to be cleared of thistles and other weeds. Not the best of jobs but we’ll be preparing the site for further plantings in Autumn. •	The Shire’s Natural Systems team will be assisting - providing tools and training. •	Please bring your gloves, hat, water, wear boots and long-sleeved clothing. •	For further information, please contact Sue on 0404 180 957. This will be the centenary of the Signing of the Armistice on November 11th 1918 ending World War 1. At Shoreham, you are invited to honour this day by joining the ceremonies and bringing any family photographs to share with us. Morning tea and heritage photograph exhibition. Buxton Reserve Working Bee - Forget me not! We’ll be weeding again making further impact on the Forget-me-nots and other weeds in Buxton Reserve. The Council supplies all tools. Please bring your own gloves and water. Best to dress for the weather - wear a hat, long sleeved shirts, long pants and boots. The plan is to do some spring cleaning” in the Shoreham Triangle. It is interesting to reflect that the Triangle prior to 2009 had 200 pine trees on the site. In a joint effort with the Mornington Peninsula Shire (MPS), clearing, planting and weeding the area has achieved a very positive result for the Shoreham community. It’s a family event for local residents to discover the diversity of the plants we have in this area and perhaps take home some ideas for their own gardens. NB: Please do not park in the CFA area (including the car park there). Parking will be available along Byrnes Road or Cliff Road. Please dress for the work and the weather: we recommend long sleeved shirts, long trousers, gloves, hats and work boots. You might also like to consider kneelers or knee pads. Tools: Please bring garden tools to suit your working preferences. Useful tools are weeding hoes, weed pullers, weed bins/buckets and garden gloves. The Bushland/ Road Reserve Group will be working at the Buxton Reserve. 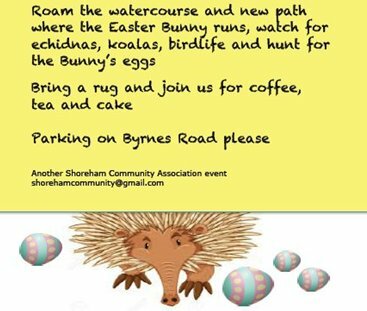 Spring is coming to Shoreham - welcome the season of winds and sunshine, spring bulbs and rain with a shared evening of great food and company at our Spring Community Dinner. Venue: the Old School Hall in Byrnes Rd. To preserve and honour the significant nature of the site as a community resource for the people of Shoreham. All friends need to sign up as members in order to vote for the incorporation. For further information: please e-mail Bill Genat, Interim Convenor, or phone him on 5989 8179. Please refer to http://shoreham.vic.au/working-bees/ for further details. Join us for the Shoreham Community Association Annual General Meeting. Please stay afterwards for a chat and the community BBQ. President's Annual Report covering the various activities and projects the SCA is working on for our community. Election of Ordinary Committee Members and Office Bearers. Guest Speaker: Allan Cowley, Manager Strategic Projects, Mornington Peninsula Shire, on the importance to Shoreham of the Green Wedge and the upcoming Coastal Villages Strategy. Time to warm up with a RETRO HOTPOT at our Winter Community Dinner - so bring along something hot to keep the cold at bay. Enjoy some good company with your friends and neighbours and share one of your golden-oldie retro recipes - Shoreham does great shared food! VENUE: Shoreham Hall, Byrnes Road. The open fire and new-fangled electric heating provide great warmth and atmosphere! BRING: Entree, mains or dessert to share. Also your plates, utensils, glass and something to drink. Following the success of our late November and March efforts, another Working Bee has been planned for the walking track on Saturday, 12th May from 09.30am - 12.00pm. If you can’t make that one, another is planned for Saturday, 23rd June. The Book Launch of CHRISTIE - The Wartime Recollections of Christopher James “Christie” Johnstone OAM as told by Christie to William (Bill) Clancy AM will be at St Peter's Church, Byrnes Road, Shoreham on Sunday 22nd April starting at 11.00 AM. Guest Speaker will be Mark Johnston, Head of History at Scotch College - one of Australia's leading authorities on WWII and author of 11 books. discuss the future Phase 2 (including the results of the MPS parking survey). Bring gloves, weather appropriate clothing, hoe spade, tube diggers... whatever you have! Tea and coffee provided, bring a plate to share. Meet at the Old School Hall. All absolutely welcome! Join in!!! ... at the Shoreham Triangle at the rear of the Shoreham CFA in Byrnes Rd. There will be an Easter Egg hunt so that families can come and explore the Triangle while the children gather Easter eggs. Please be aware that children will have to be closely supervised as there is no fence on either the west side of Triangle which fronts onto the very busy Frankston - Flinders Road, or on the Byrnes Road boundary. The Triangle was cleared of over 100 pine trees by Mornington Peninsula Shire in 2009 and replanted with native shrubs, trees and grasses by local community volunteers. The path adjoining the water feature that meanders through the area is known to be where the Easter Bunny ran last year. The area also attracts echidnas, koalas and numerous native birds - so bring a rug to sit and look. The event will not take long so you can get back home for lunch. Tea & coffee will be available. Entry is off Byrnes Rd so we suggest you park cars in Byrnes Rd to keep the CFA area clear in case there is a call out.